Total Elevation Gain: 4409 ft. This was our fifth day of 14ers in a row. By now I think the legs were so used to the daily beating that they just went along with it with little complaint. We decided on doing the Missouri Gulch route for Missouri. We left our home base and were on the road around 6:15am, a modestly early start. We found CO-390 and headed off US24 for Vicksburg. This got us to the Missouri Gulch TH about 6:50am. We headed up the trail which begins with a bridge over Clear Creek and then involves several steep switchbacks in the trees. This trailhead is at 9800 feet and so its a long day of climbing. We made it up through the switchbacks with very little stopping and soon found ourselves at the broken down cabin (okay, so it took us about an hour). There we put the good ole suntan lotion on (heavily!) and it wasn't long till we were out in the trees. There was one stream crossing just below the cabin which involves walking over three fairly thin logs to cross. We were also surprised along the way at how many Columbines there were to see. One of the meadows was just full of them. Great sight! From this point on the trail wasn't nearly so steep and actually was just beautiful hiking. The trail progressively takes you up into Missouri Gulch with Missouri Mountain being the high point on the ridge ahead of you the whole way. At some point the Mt. Belford trail breaks off and this junction was well signed. We couldn't get past how beautiful the hiking was and how well done the trail was. There were a few more stream crossings as you went deeper into Missouri Gulch, and these involve hopping rocks to get across. Dad ended up with a wet shoe on one of them as one of the best stepstones had water running over its top. We were worried about the amount of snow we would find back in there and from a distance it did look as though we would still see a lot of it. We ran into some backpackers hiking out that day and they said there is some snow to cross, but it ain't bad, and some of it can be avoided even. Deeper into Missouri Gulch the trail starts to approach the base of the Missouri Mountain summit, here there is another junction where the Elkhead Pass trail heads to the left and the Missouri trail ascends to the right. From here you ascend a grass slope with some switchbacks. At the top of that slope we crossed an easy snowfield. From here the trail veers to the right and heads for the rocks at the base of the 13er Point 13, 784'. There is an amazing rock trail leading you up to the face of Point 13,784'. The trail then traverses along this face with a steep dirt trail in which much of the left side of this trail as you ascend is washing out. 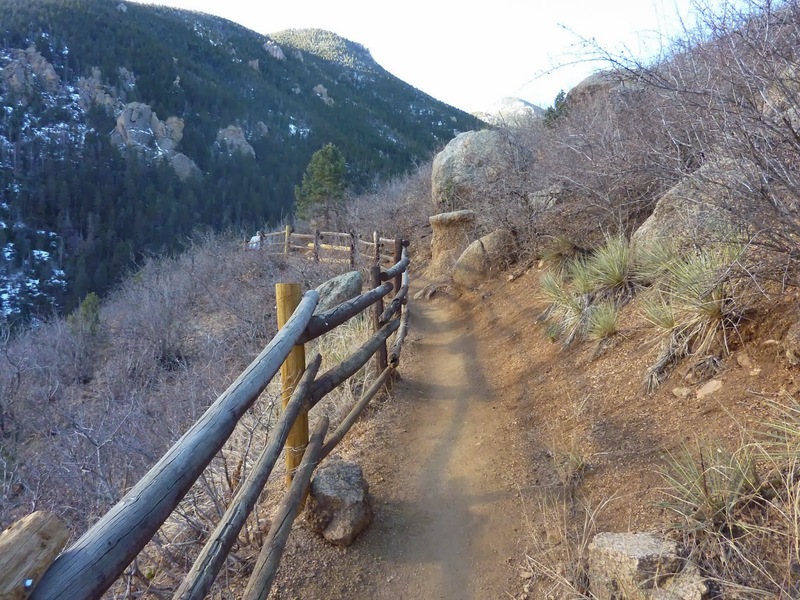 This trail works its way up to the saddle on the Missouri ridge. Just before you reach the saddle the hiking gets much steeper. There was a large snowfield covering the approach to the saddle. On our ascent we decided to veer around the snow and climb steep loose talus up to the ridge. This worked but it was very steep climbing. On our descent we went through the snow and found this to be the easier route. The snow involve some straight down-hiking in the snow but the steps were deeply melted in. Once on the summit ridge heading for Missouri the first 3/4 of the ridge were easy hiking along and near the crest of the ridge. Nearing the summit there are two crux points along the ridge. There is a 20-foot descent on very steep loose dirt and rock with some exposure below. The exposure is a steep talus slope. Once this 20-foot descent is completed you hike 50 feet on level ground with the exposed talus slope to your right and your walking area very narrow. At the end of this 50 foot run you then ascend 10 feet or so through a near vertical notch where the trail continues. From this point it is a very steep loose dirt trail to the summit. We summited at 11:01am after a 4hr 9 min climb. We enjoyed as usual the views from the summit and met a marmot up there as well. We only ran into one other person during our time on the summit which was a pleasant change from yesterday on Princeton. We spent a good 30 minutes or so on top and began our descent. The descent went very easily. We downclimbed through the steep sections on the ridge and made our way back to the saddle. We had fun descending through the large snowfield and I tried out the yaktrax's there. The rest of the hike out was just a beautiful hike on great trail. We ran into a large youth group on the trail coming up. They would backpack the night and then hike Belford the next day. We didn't so much enjoy the long hike through the switchbacks in the forest and Dad almost had a bad accident. He nearly tripped up and ran off the trail into a tree. Luckily he didn't hit the tree at any great speed and it actually saved him from rolling down the side of the hill for a good ways. We made it back to the car at 2:44pm after a 3hr 19 min descent. It was great to finally have a rest for the legs after 5 14ers in 5 days. The drive out felt good and we really enjoyed the Missouri hike. From there we headed to Leadville for the second day in a row and we had "lunch" at Doc Holliday's bar and grill. We had more outstanding burgers there. 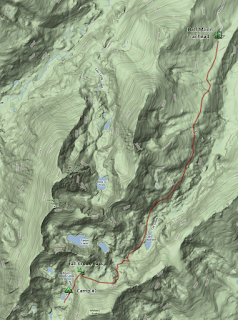 I have two GPX track files from this hike. One for the ascent and one for the descent. The route in both directions should be nearly identical. I put them into KML for download.